Investors looking for substantial returns without gambling on cryptocurrency should consider two e-commerce providers and a streaming video platform. It's easy to understand the lure of bitcoin and other cryptocurrencies. Getting in on the ground floor of a once-in-a-lifetime opportunity and earning a massive return in a very short time is certainly appealing. Unfortunately, the volatility and the much greater risk of these unvetted new asset classes can also result in significant losses, as investors have recently learned. After peaking at over $19,000 per share in December, bitcoin has lost nearly 70% of its value, recently falling below $6,000. There are other more traditional ways to increase your odds of achieving noteworthy gains, like tapping into changes in consumer behavior or investing early in ongoing demographic shifts. With that in mind, we asked three Fool.com contributors to choose companies that they believed had significant untapped potential. Read on to find out why they chose Amazon.com (NASDAQ:AMZN), JD.com (NASDAQ:JD), and iQiyi (NASDAQ:IQ). Chris Neiger (Amazon): I understand the draw of bitcoin. People want to see their hard-earned money grow quickly. But huge gains don't have to come with the level of volatility that accompanies bitcoin. Instead, investors can invest their money with Amazon, which has a very stable (and growing) business, and still experience huge share-price gains. 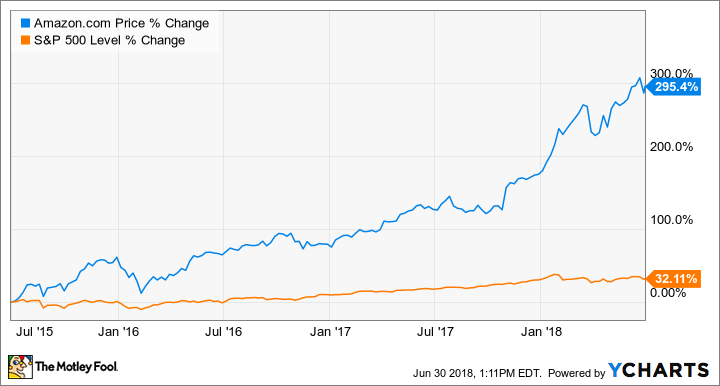 Over the past year, Amazon's stock price has surged more than 70% -- far outpacing the S&P 500's 12% -- and is up nearly 300% over the past three years. Not only have Amazon's shares easily beaten the market, but the company is also continually making the right moves to set itself up for a successful future. For example, Amazon is the leader in the cloud computing space through its Amazon Web Services. AWS held 33% of the cloud infrastructure market in the first quarter of this year, followed by Microsoft with 13% and Alphabet's Google with just 6%. Amazon's cloud computing segment earned $5.4 billion in sales in the first quarter, which was a 49% increase year over year. The cloud computing market is expected to grow into a $411 billion business by 2020, up from $305 billion this year, which means there's plenty of room for Amazon to continue tapping this segment. Of course, Amazon makes the majority of its top line from sales on its e-commerce platform. In the first quarter of this year, its North American sales hit $30.7 billion, up 46% from the year-ago quarter. But Amazon has plenty of other opportunities to grow its business as well. The company is already a leader in the burgeoning smart speaker space with its Echo devices and Amazon is using them to bring more people into its e-commerce ecosystem and spend more money on its platform. In short, Amazon has very strong businesses that are continually growing and it's delivering strong share-price gains for its investors. Of course, there's no guarantee that Amazon will continue growing at the same pace that it has in the past, but when compared to the current volatility of bitcoin, it looks like a much safer bet. Jeremy Bowman (JD.com): Bitcoin mania seems to have come and gone, but China's blockbuster economic growth is here to stay. The world's second-largest economy is expected to expand by nearly 7% this year, and is set to overtake the U.S. as No. 1 in the next generation. In other words, opportunity abounds. You may have heard of Alibaba, the owner of Tmall and Taobao, the largest platforms for online retail in China, but you may not be familiar with JD.com. In fact, JD.com is the biggest direct online retailer in China as, like Amazon, it sells products both directly and through a third-party marketplace. JD is also outgrowing Alibaba, taking market share from its larger rival, as its market share of Chinese e-commerce nearly doubled from 18% to 33% from 2014 to 2017. Even better, the company has scored sizable investments from both Walmart and Alphabet. Walmart took a 5% stake in JD.com in exchange for selling its Yihaodian online retail site to JD in 2016, which later increased it to 11%. Alphabet, meanwhile, just invested $550 million into JD as part of a strategic partnership to provide frictionless shopping experiences in various markets around the world. Those partnerships are also key because JD has ambitions of expanding beyond Asia, into Europe and the U.S., where it will directly challenge Amazon, and no two companies are closer rivals to Amazon than Walmart and Alphabet. Combine that alliance with JD's opportunity in China and it's easy to see how the stock could eventually be worth many times more than its $56 billion market cap today. Danny Vena (iQiyi): Investors willing to take on additional risk for the potential of life-changing returns don't need to resort to currency speculation, but can instead invest in a recently public, well-backed business involved in a paradigm shift in consumer behavior. Knowing what they know now, few investors would have passed on the chance to invest in Netflix when streaming video was first taking hold. While more than half of consumers in the U.S. pay for a streaming service, that number is still far lower in China, currently at only about 13%. In previous years, Chinese consumers were content to use ad-supported services and piracy to satisfy their entertainment needs, but the tide is turning. One company that is positioned to capitalize on this growing trend is iQiyi (pronounced i-chee-yee), which is often referred to as "The Netflix of China," and one of the largest providers of streaming video in the Middle Kingdom. The company recently completed its IPO in a spinoff from Chinese search giant Baidu, which is still the majority shareholder. Having one of China's largest companies as a supporter and benefactor is a huge advantage for both the company and its shareholders. As an example, Baidu provides artificial intelligence that helps iQiyi hone in on the most desirable programming for its customers. There are plenty of other reasons to like iQiyi going forward. The company has more than 50 million paying subscribers and many more who still use the ad-supported option, giving the company a fertile field for growth. iQiyi recently partnered with JD.com to allow consumers to sign up for a premium membership, while enjoying the benefits of both for a year, a move that encouraged over a million new members in the first week alone. iQiyi was also recently selected by Forbes as one of the 50 most innovative companies in China. iQiyi gives investors the opportunity to generate substantial gains -- with a much lower risk profile than bitcoin.